As I’ve gotten older, I’ve come to appreciate breakfast more and more, especially on those mornings when I wake up with a growling stomach (most mornings…). So this makes Angela’s (Canned Time) Breakfast in Bed Fest right up my alley! You can probably guess what my contribution is gonna be, right?? Below is the recipe for the pancake and waffle mix I contributed. It can be prepared Plain Jane – or – it can be tweaked, customized, and adapted to your own favorite flavors. To get you started, I’ve included three variations: apple/cinnamon, orange poppyseed, and chocolate brownie. For all of the recipes and photos, please visit Canned Time and while you’re there, be sure to visit the earlier BiB entries – they are all delicious! Whisk up a batch of this versatile, adaptable waffle/pancake mix, then store it in your refrigerator until you are ready to make a delicious, healthy plant-based breakfast. In a large bowl, combine all of the dry ingredients and whisk until thoroughly combined. Divide the batch among four containers or plastic bags – about 2 cups per container/bag. Wet ingredients obviously do not get stirred into the waffle/pancake mix until you are ready to make a batch to cook and eat. I didn’t see your entry there, but perhaps it hasn’t been put on yet? The others look amazing, I especially like the look of the cashew yoghurt, I’d have that as a pudding. It should be up now, Lorna. I had another look but didn’t see it, however Angela’s comment below explains that. Okay, it’s added now. Plus the post is available on the homepage of course. Hurrah for Breakfast in BedFest! Pancakes and waffles for all my friends ;-)! MMMMMM,… This sounds very good! Haha! That makes me feel good. Thanks so much :-). I love breakfast, I don’t last long without it!! These look SO good..all of them! 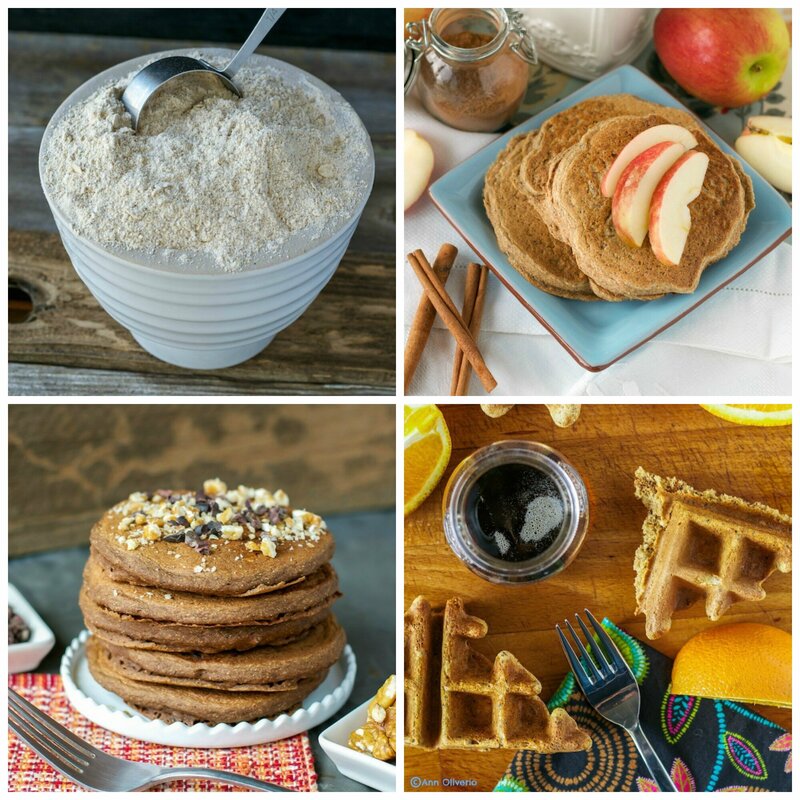 Love this Breakfast in Bed roundup! Those apple pancakes look divine! Really need to make leisurely weekend breakfasts more often.